Audi Freehold in Freehold, NJ treats the needs of each individual customer with paramount concern. We know that you have high expectations, and as a car dealer we enjoy the challenge of meeting and exceeding those standards each and every time. Allow us to demonstrate our commitment to excellence! Our experienced sales staff is eager to share its knowledge and enthusiasm with you. We encourage you to browse our online inventory, schedule a test drive and investigate financing options. You can also request more information about a vehicle using our online form or by calling 732-810-8000. Welcome to Audi Freehold, your local Audi dealership near Freehold, Manalapan, and Monroe Township. At our dealership, our entire team is focused on making your experience as streamlined and enjoyable as possible. We are here to help you find a vehicle that you love and keep it in great condition for many more years on the road. Our showroom is full of all of your favorite Audi models, from the sporty A4 sedan to the capable Q7 SUV. No matter your lifestyle, there’s an Audi model to suit your needs. Our team is here to help you find out which of them is the perfect fit for you, and you can even begin right now by taking a look through our online inventory of new and used models listed on our website. Use the filtering tools to quickly and easily narrow in on the models that best meet your criteria, and then reach out to schedule a test drive of your favorites. Once you’ve chosen an Audi model that you’d like to drive home with you, you’ll need to find a great payment plan for your purchase before you can do so. Our Audi Financing Center. Begin by submitting a financing application online,and once you click submit, our team will be able to immediately get started on putting together your loan or lease plan. They’ll reach out to discuss your options with you as soon as possible, so you can get to the most important part of the process: driving home in your new car! Long after you’ve driven your car home, you can always come back and visit us at the dealership. Our Auto Repair Center. is here to assist you in keeping your car in great condition for years into the future. It’s important to bring your Audi in to our team of expert auto technicians every few months for regularly scheduled maintenance appointments in order to keep it running smoothly and safely and prevent any problems from developing. 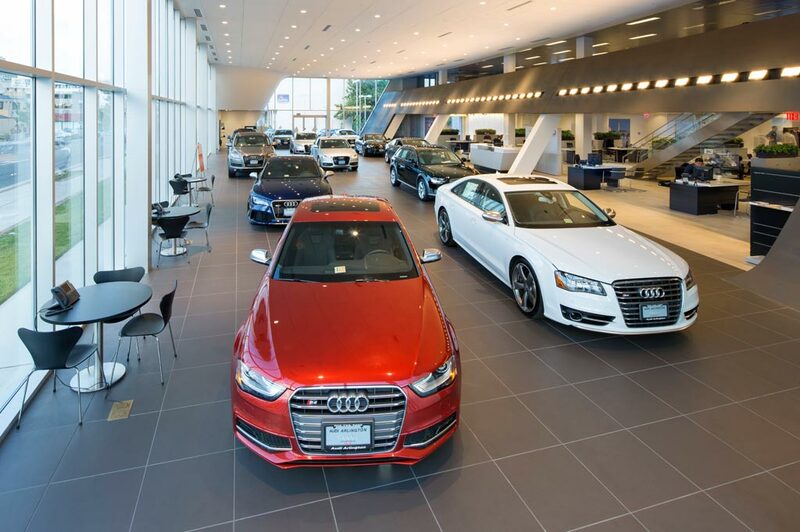 When you come visit our Audi dealership, you’ll find a freshly renovated, beautiful showroom that’s packed with amenities for you to enjoy. Our waiting area is equipped with free Wi-Fi and plenty of power outlets, so you can get some work done while you wait for your Audi service and repairs. We also have a pool table, so if you’d like to unwind, you can play a quick game. Our team can correct any problems that arise with your vehicle quickly and efficiently, so you can get back on the road. Our team is here to help you find the car of your dreams, and we can’t wait to get started! Take a look around our website to learn more about our services and the vehicles we offer, and feel free to contact us any time. with any questions that you might have.